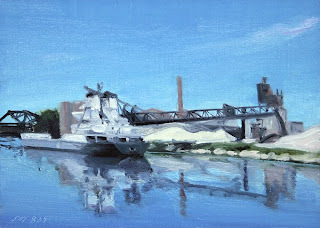 Today's daily painting is of the freighter Manitowoc unloading on the Rouge River. 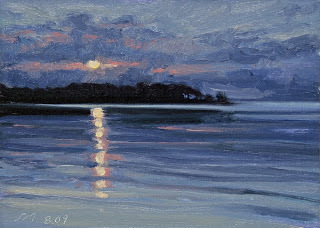 I will be doing this as a larger painting for the David Klein Gallery. 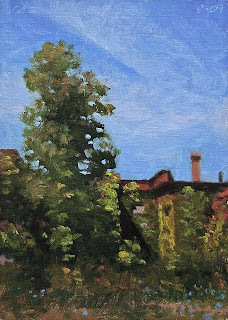 Today is also my Birthday and it is a beautiful cool sunny day, hope to spend some time in the studio and later cupcakes on the yard with the neighborhood children. 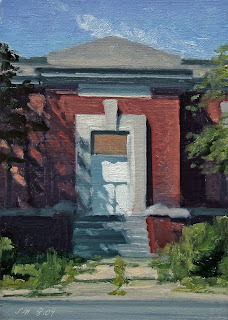 Today's daily painting is of an abandoned Detroit Public Library, the George V. N. Lothrop branch. The seventeenth in the series of portraits of abandoned Detroit building. 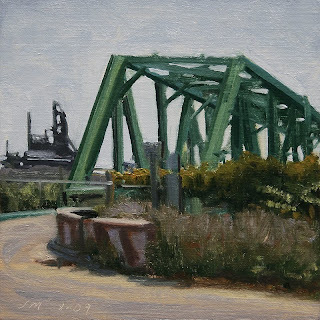 Today's daily painting is of the swing bridge to Zug Island, with Great Lakes Steel in the background. 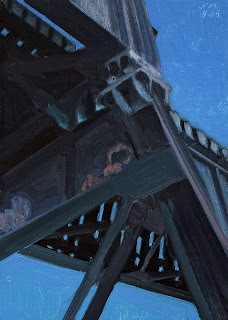 Today's painting is a detail of the RR Bridge over the Huron River in Ann Arbor, MI. I really like the way the bridge bulked up against the blue sky. 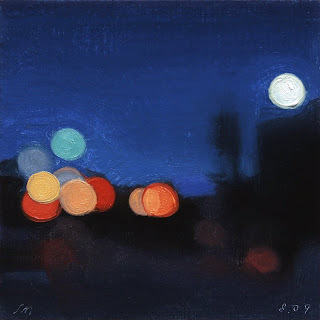 This is my 700 th painting posted to Postcards from Detroit since August 2007. Thanks to everyone who has been a part of this journey. 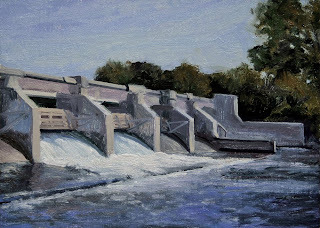 Today's painting is a scene with the Argo Dam on the Huron River in Ann Arbor. We had some errands to run in Ann Arbor yesterday and took some time to visit this dam and park. There were a few rowers on the pond reminding us of Thomas Eakins famous single scull paintings. Argo pond is used by as many as 600 rowers, including U-M's men's club team and the Ann Arbor Rowing club. 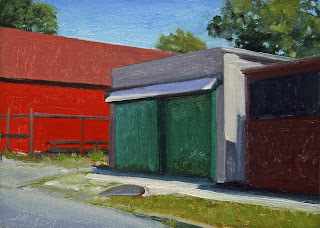 I really like the abstract composition that these colorful buildings make. 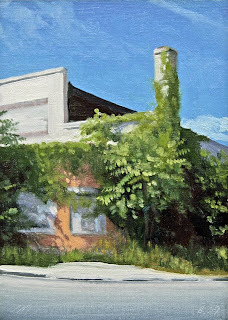 Today's painting is of an Ivy covered building in Brush Park, Detroit. 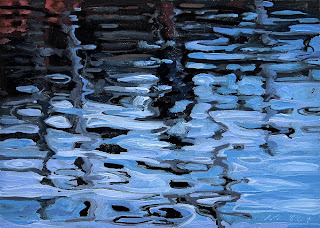 The sixteenth in the Abandoned, Portraits of Detroit series of paintings. 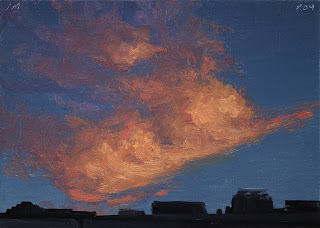 Today's painting is of a fiery cloud over Detroit. 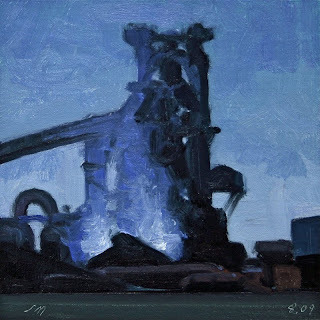 I was excited by the color and contrast over our dark city. 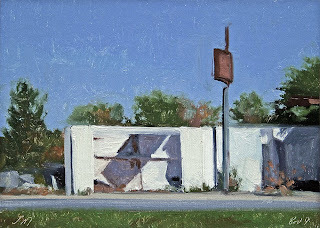 Today's painting is of finding beauty in the simple shapes of an abandoned building. The color and designs made from the cast shadows on this building really caught my interest. It has such clarity. The fifteenth in the AD "Abandoned Detroit" portraits. 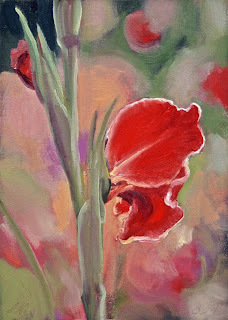 Today's painting is of one of Janet's red Gladiolus, Atom 1946. These were a gift for her birthday this spring. 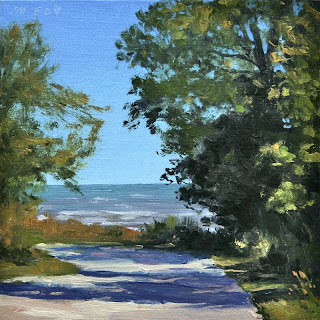 We have been enjoying them this beautiful summer. 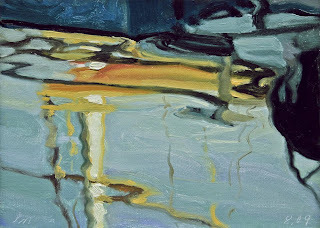 Today's painting is of boat and sky reflections on water. 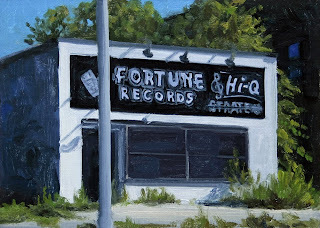 Today's painting is the fifteenth in the Abandoned, Portraits of Detroit series. 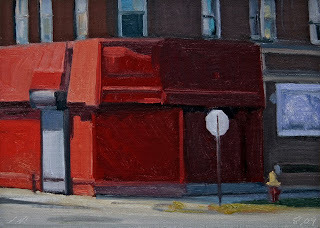 This corner red building is on Michigan Ave near the old train station. 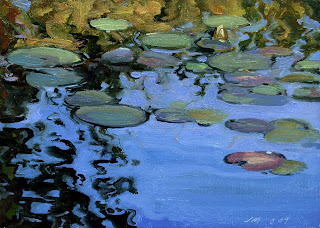 Today's painting is of Water Lilies and reflections on a Belle Isle pond. 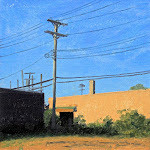 Today's painting is the fourteenth in the Abandoned, Portraits of Detroit series. 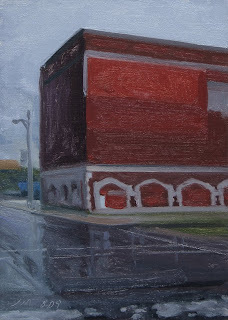 This large red building on Woodward Ave looks more ominous in the rain. 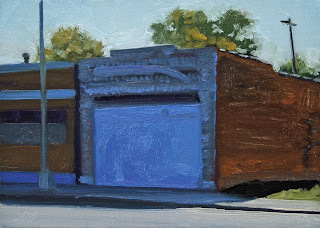 Today's painting is the twelfth of the Abandoned, Portraits of Detroit series of paintings. 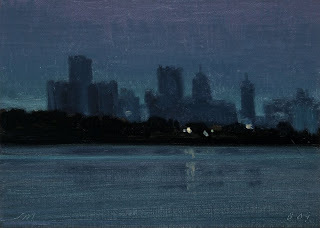 Today's painting is a nocturne view of the Detroit skyline seen from the Detroit River. 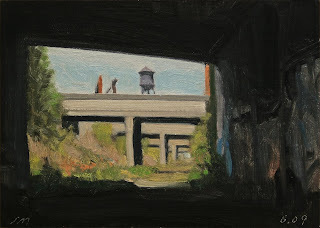 Today's painting is the view looking North from the Dequindre Cut near Eastern Market in Detroit. This section of the Dequindre Cut has not been completed. 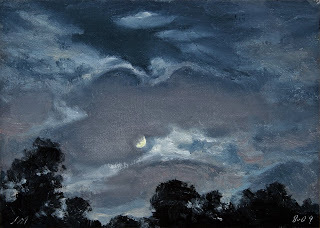 Today's painting is a nocturne of the moon and backlit clouds outside my studio the other night. 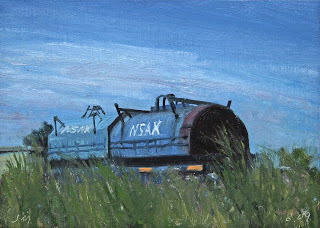 Today's painting is of National Steel Corp. RR cars, near the Great Lakes Steel plant on Zug Island. 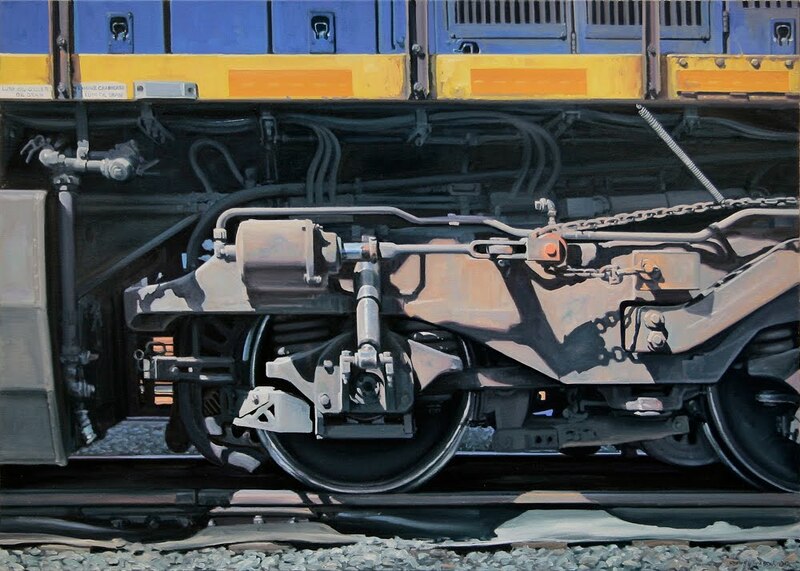 These cars are used to haul rolls of coiled steel, the covers are to protect the cargo. 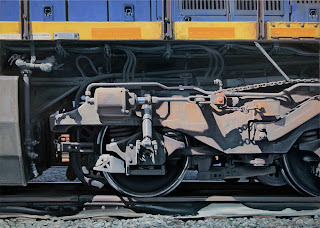 This painting is of the drive wheels of CSX#9 at the River Rouge Plant. 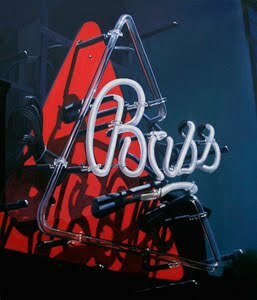 Please contact the gallery if you are interested in this painting. 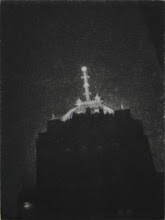 Today's painting is the eleventh in the Abandoned Detroit series. 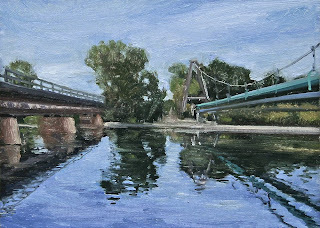 Today's painting is a RR Bridge and industrial pipes over and reflected on the Rouge River. I was able to go out on this bridge to get some great shots.